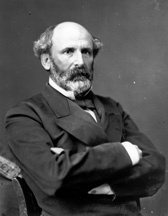 RANSOM, Matt Whitaker, (cousin of Wharton Jackson Green), a Senator from North Carolina; born in Warren County, N.C., October 8, 1826; attended a private academy; graduated from the University of North Carolina at Chapel Hill in 1847; studied law; admitted to the bar and commenced practice in Warrenton, N.C.; presidential elector on the Whig ticket in 1852; attorney general of North Carolina 1852-1855, when he resigned; member, State house of commons 1858-1861; peace commissioner to the Provisional Congress at Montgomery, Ala., in 1861; entered the Confederate Army and served throughout the Civil War, attaining the rank of major general; moved to Weldon, N.C., in 1866; planter and lawyer; elected as a Democrat to the United States Senate in 1872 to fill the vacancy in the term commencing March 4, 1871; reelected in 1876, 1883, and 1889 and served from January 30, 1872, to March 3, 1895; unsuccessful candidate for reelection; served as President pro tempore of the Senate during the Fifty-third Congress; chairman, Committee on Commerce (Forty-sixth and Fifty-third Congresses), Committee on Railroads (Forty-sixth Congress), Committee on Private Land Claims (Forty-ninth through Fifty-second Congresses); United States Minister to Mexico 1895-1897; engaged in agricultural pursuits; died near Garysburg, Northampton County, N.C., on October 8, 1904; interment in the private burying ground on his estate, Verona, near Weldon, Northampton County, N.C.
American National Biography; Dictionary of American Biography; North Carolina. Historical Commission. Addresses at the Unveiling of the Bust of Matt W. Ransom. Raleigh: Edwards & Broughton Printing Co., 1911.